Make your social media presence work for your small business, even when you’re not online. SnapRetail takes the guesswork out of what to say to your customers and integrates all of your favorite social media networks into one powerful tool. Focus on sharing content, not switching between accounts. Ready-to-schedule social and email ideas right on your calendar. 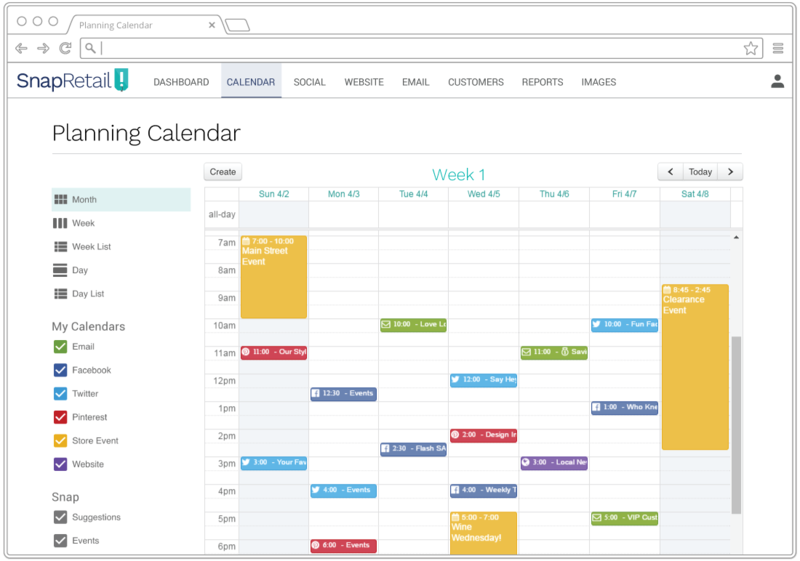 Control all your small business marketing from one planning calendar. Integrate your Facebook, Twitter, Pinterest, and Instagram account. We give you a monthly marketing calendar full of ready-to-send social and email ideas. Each month, social and email ideas are placed directly on your marketing planning calendar. 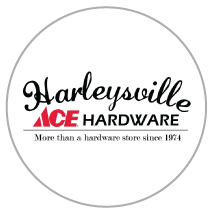 Click to schedule. Done. We give you ideas for each day of the month, helping keep you engaged online and with your customers. Struggling with what to say online? SnapRetail’s social content library is just what you need to stay connected with customers online without spending hours on Facebook, Instagram, Twitter, and Pinterest. 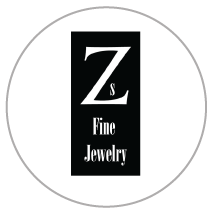 With over 2,000 pre-written small business specific posts, you’ll always have something to share with your customers. You’ll get access to over 1,300 stock images, making it easier than ever to find the perfect photo for your social posts. When your business schedule gets backed up, your social profiles keep moving forward. 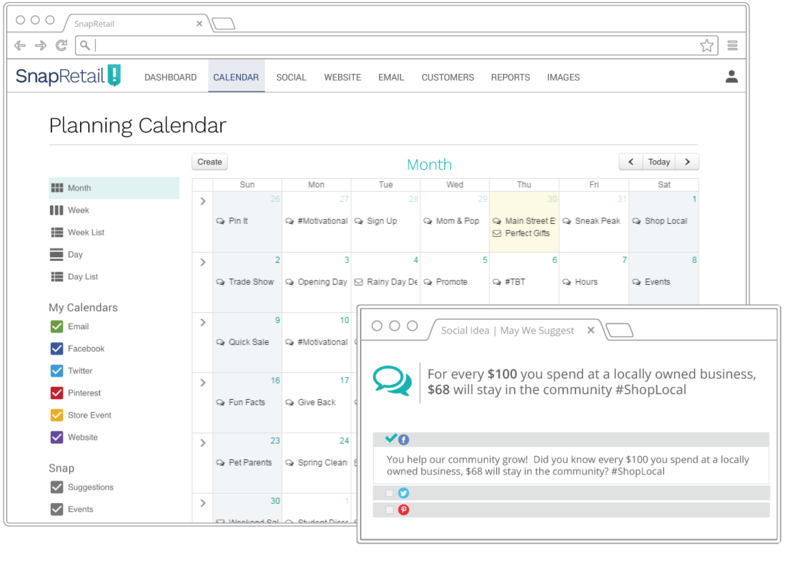 Click on any date to schedule your social posts or drag-and-drop to tweak your small business marketing schedule. Plan your marketing by the day, week, or month. We have no limits. Our planning calendar lets you share scheduled events with anyone through our iCal links. When it comes to social media, there is no such thing as oversharing. 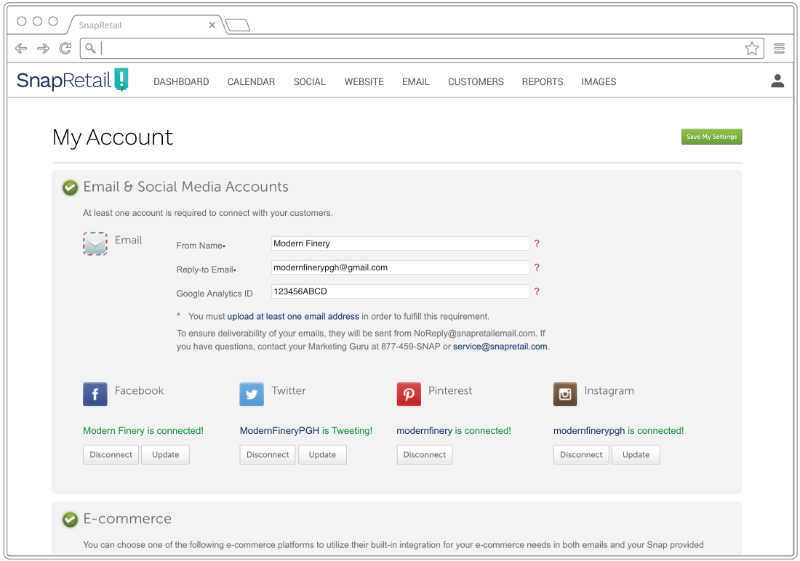 SnapRetail saves you time by integrating all of your favorite social media outlets into a single, easy-to-use platform. 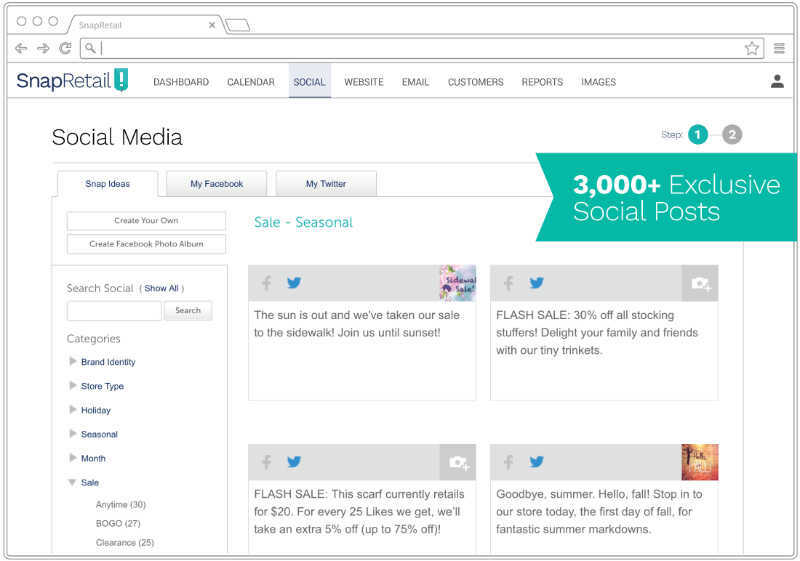 Save time by scheduling all your Facebook and Twitter posts in one place. You spend a lot of time creating the perfect photo for Instagram, we let you share those photos online. Create new boards or schedule pins to existing ones with a few clicks. We love how the scheduling system makes it incredibly easy to plan out social media in advance. Not sure how we managed before Snap! SnapRetail makes my life so much easier! It would take me twice as long to do things without! Book time with an expert to get started today!